Introducing Yoga: Flow with the Butterflies, breathe deep and enjoy the tranquility of the garden. We are now holding Yoga Sessions in the Butterfly House! The classes are a gentle, beginners Vinyasa yoga. Due to the intimate setting, classes will cater to the needs of the participants and will vary slightly each session. The butterflies are just starting to wake up when the class begins, it’s a magical thing to be flowing through your sun salutations while seeing the first flashes of color fluttering around you. Don’t be surprised if the butterflies come and visit you while holding a pose. They LOVE sweat, and prepare for a deep cleanse, as the greenhouse gets nice and toasty. Definitely bring water in addition to your mat. I personally like to use gripper gloves and socks to prevent slippage on my mat. 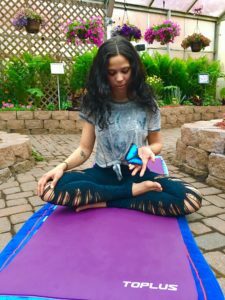 Others like the non-slip yoga towels, find what fits your needs and come experience a unique yoga flow to help you connect with yourself and nature. We are thrilled to be finally offering this amazing opportunity. If you join our classes, please give us your feedback. We want to make the sessions as peaceful and rewarding as possible. Only a few spaces are left for the May 4th session! Reserve your spot now. Due to the intimate setting of the butterfly house, only ten slots are available per session. present your email confirmation/receipt to gain entry into the garden. A signed waiver will be required in order to participate. We look forward to flowing with you!